Many small business owners rely on email as a primary mode of business communication. This is not surprising; email is quick, easy and provides a paper trail. But that doesn't mean that your email messages, especially when it comes to business communication, should be relaxed. In fact, poor email communication can cost you customers while hurting your brand and your reputation. Sending professional business email comes down to creating habits that focus on clear, succinct and appropriate communication. When you are a business owner, conducting business on behalf of your company, make sure you are using a business email address. Ideally, that means you have a business address (i.e., yourname@yourbusiness.com) that you use for all business communication. If that's not possible, you can create a free email address that includes your business name (i.e., yourbusinessname@gmail.com). Using a personal email address that is clearly unrelated to your business can, at worst, hurt your professionalism and in many cases you may not be taken seriously. There's nothing wrong with explaining things in great detail; it can provide clarity and reduce misunderstandings. But when an email message starts to look like a novel, you can quickly lose the recipient's attention and confuse the issue with irrelevant information. To avoid this, stick with one subject per email, and when you do need to include more information, use bolded subheads so the most important details are clear. Have you ever opened an email message based on the subject, and ended up completely confused and a little annoyed when it was about something entirely different? Since you're already keeping each email you write limited to one subject per the tip above, you should also make sure your subject line reflects that topic and nothing else. This will not only help the recipient, but it will also help make it easier for you to manage your own email inbox. It's easy to let things fly when you're sending an email because you may feel like you're protected by your computer screen, but some conversations can easily be misunderstood in email. In fact, without verbal communication cues to temper the message you are sending, any email can be taken the wrong way. If you are sending a message that may be questionable, reread it before sending and if you're still not sure, you're probably better off picking up the phone. Quotes, promotions and newsletters signups in an email signature may be effective in some situations, but those items should never trump using your email signature for what it's meant to be used for -- providing your contact information. Your initial email or reply should include an email signature with your full name, company, and URL at a minimum. A phone number, title and restating your e-mail address doesn't hurt either. Spell checking is easy. Make it a default setting in your email client to check all messages before you send them. Email is more informal and there is a little more leniency with spelling and grammatical errors, but it looks awful to send a message riddled with errors. The last thing you want is to make a bad impression because you were rushing to send an email and skipped checking your spelling and grammar. Email is an important method of communication in business, even if it's not your first preference. 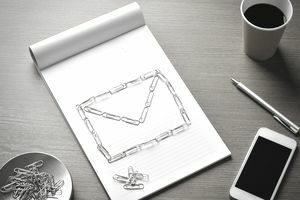 Following these business email best practices will help you keep your email communication professional and productive, and you can be confident that the impression you're making is a good one. Want To Know How to Create a Social Media Plan for Your Business? Does Your Online Business Have Enough Payment Options?